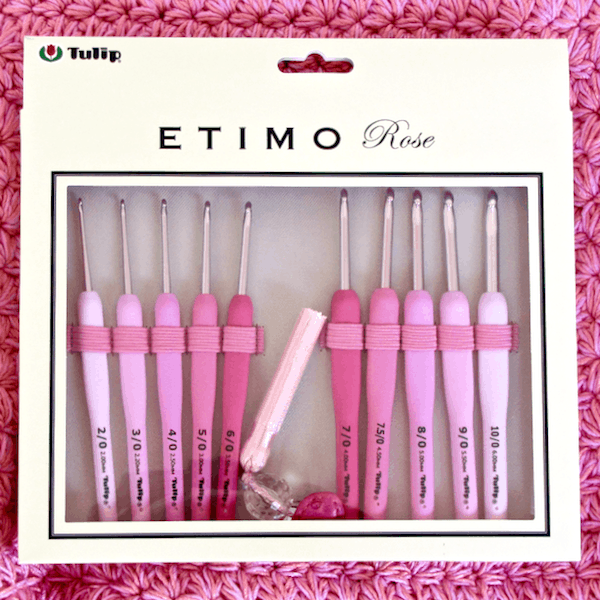 An exquisite set of ten rose-tinted crochet hooks with Tulip’s special Etimo elastomer comfort grip handles. The elegant faux-ostrich case includes ruler, yarn needles, and high grade Italian needlecraft scissors in their own accessories pocket. The case closes securely with a pink tasseled crystal-embellished zipper! A set of 8 gold-finish crochet hooks with Tulip’s special Etimo elastomer comfort grip handles in a slate color. A lavish gift for the pampered crocheter. The crochet hook tip is finely polished and hooks the yarn easily. Combined with the almost velvety touch of the ergonomic easy-grip handle, this is a luxurious crochet experience. The original—and still the best. These crochet hooks are made of fine stainless steel in Tulip’s factory in Hiroshima, Japan. The needles and scissors are nickel-coated steel. We also offer these pink Etimo crochet hooks individually. Many have copied Tulip’s exciting Etimo crochet hook. Some imitations feel plastic-y, sticky, or smell like rubber tires. Sucre is Tulip’s specialty steel crochet hook set. The hook heads are streamlined for bead crocheting as well as for lace crochet. 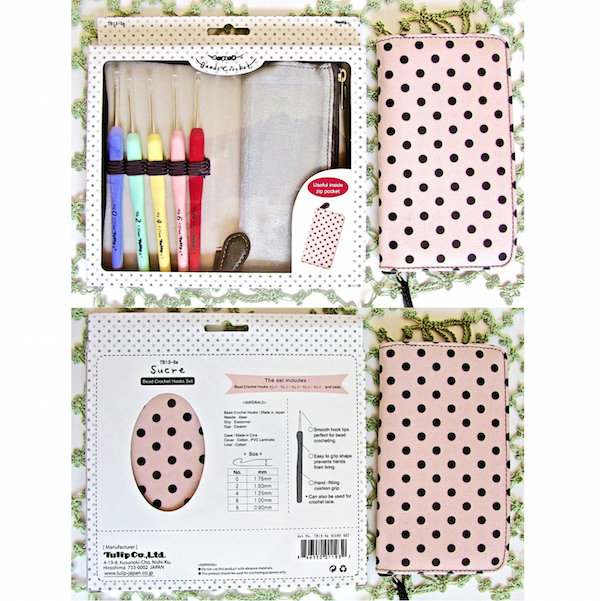 Five sizes fit in their own polkadot carrying case. You can also buy Sucre Cushioned Beading Crochet Hooks separately. Signature “Etimo” elastomeric cushion grip, in pastel colors: a special feature. They’re designed to give many comfortable hours of crocheting with thread and beads. Many have copied Tulip’s exciting crochet hook. Tulip’s handles are the original and still the best! Some imitations feel plastic-y, sticky, or smell like rubber tires. The soft vinyl case opens like a small book and zips closed. It has an inner mesh zippered pocket. Each crochet hook has its own elastic slot and comes with a good-fitting tube cap to protect the hook head. They’re made of a nicer type of plastic than other caps I have from other brands. These caps don’t readily crack, scratch, or stretch out. Steel Crochet Hook Sizes in the Sucre set in order of smallest to largest size (labeled sizes vary widely among different brands of steel hooks (and time of manufacture). We also offer these hooks singly. Wondering about using seed beads with these steel hooks? Bead hole sizes and labeling vary among manufacturers, colors, finishes, and also within the same bead batch. The mm. size of a crochet hook does not typically measure the girth of the hook tip, so a crochet hook made in a different style, or at a different time within the same brand might coordinate differently with bead sizes. Try to use the biggest crochet hook size for the job, if you are adding beads to a lace weight yarn project. This reduces snagging any partially slicing through delicate fibers. Seed bead size 1° or 1/0 (a.k.a. “jumbo seed bead”) fits almost 100% of the time onto the 1.75 mm Sucre Bead Crochet Hook. Seed bead size 6° or 6/0 (a.k.a. “E-bead”) fits almost 100% of the time onto the 1.25 mm Sucre Bead Crochet Hook. The holes of seed beads can be a bit irregular within the same batch. The heads of these bead hooks, compared to other Tulip steel crochet hooks I tested, have a shape that makes them fit easier through seed beads. I could feel the difference more than see it as I tried slipping several beads of different sizes and brands onto the hooks. This is one of several steel crochet hook sets we carry. Each set is durable, charming, and smartly designed because it’s made by the Tulip Needle Company. Scroll to the bottom to see more sets. 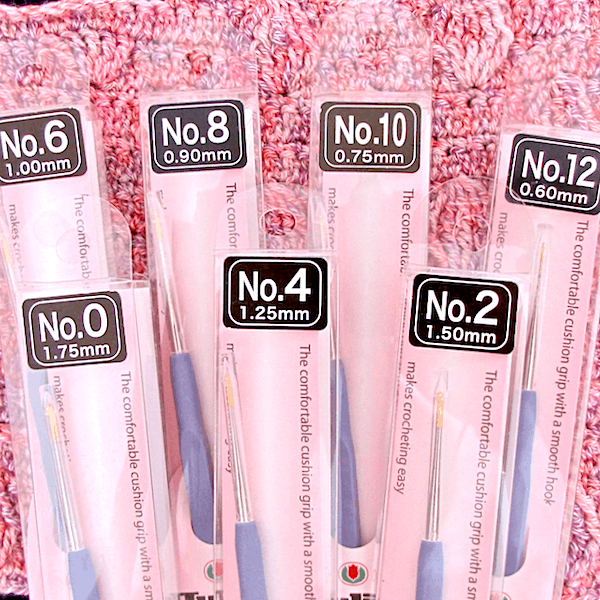 Note that the Classic 4 Set contains 5 steel crochet hook sizes as well as 8 larger aluminum hook sizes. If your order contains more than one shippable (not downloadable) item, the shipping method automatically upgrades FREE from USPS First Class to Priority Mail. Priority mail shipments take just 2 or 3 days to arrive under normal conditions. “ETIMO” refers to the special type of crochet hook handle. All “Etimo” hooks feature Tulip’s signature elastomeric cushion grip. The hook on this page—a gold aluminum with grey handle—is the original Etimo model. Since then, the Tulip Needle Company has added a Rose version (sweet pink colors replace the gold and grey). Also see the Etimo steel hooks for crocheting with thread and lace weight yarns. THIS IS THE CROCHET HOOK that won our hearts the first time we (Doris and Vashti) held one at the National Needle Arts trade show in 2010. This was the first show booth in the USA for the Tulip Needle Co. of Hiroshima, Japan. Since then, many have copied Tulip’s exciting crochet hook. Tulip’s elastomeric handles are the original and still the best! Some imitations feel sticky, plastic-y, or smell like rubber tires. 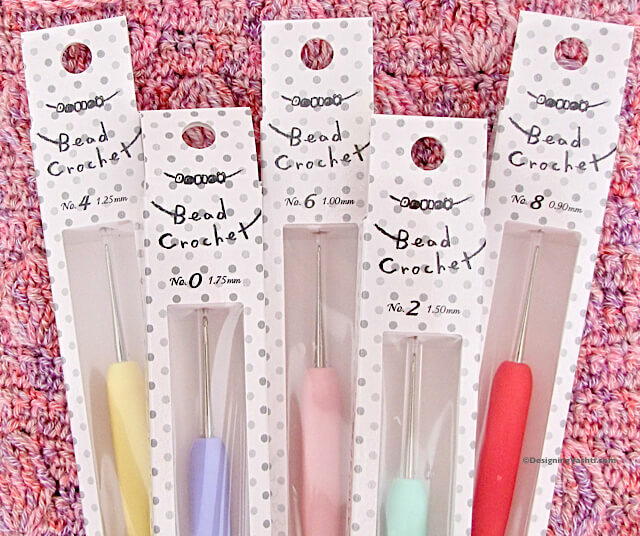 The heads of these bead hooks, compared to other Tulip steel crochet hooks we tested, have a shape that makes them fit easier through the slightly irregular holes of seed beads. I could feel the difference more than see it as I tried slipping several beads of different sizes and brands onto the hooks. Each comes with a good-fitting tube cap to protect the hook head. These caps are made of a nicer type of plastic than other caps we have from other brands. These caps don’t readily crack, scratch, or stretch out. The signature “Etimo” elastomeric cushion grip in pastel colors is a special feature. They’re designed to give many comfortable hours of crocheting with thread and beads. Many have copied Tulip’s exciting crochet hook. Tulip’s handles are the original and still the best! Some imitations feel plastic-y, sticky, or smell like rubber tires. Select from among the available sizes in the drop-down menu, listed in order of smallest to largest size. (Labeled sizes vary widely among different brands of steel hooks and time of manufacture). Try to use the biggest crochet hook size for the job, if you are adding beads to a lace weight yarn project. This reduces snagging and the risk of slicing through delicate fibers. 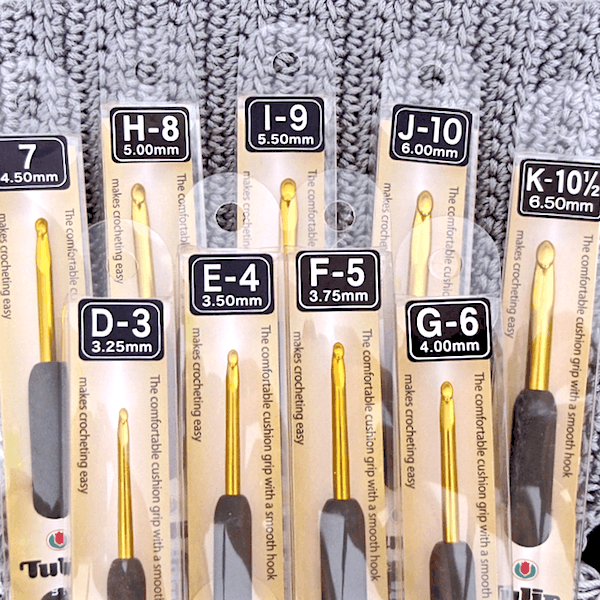 Each classic Etimo steel crochet hook comes with a good-fitting tube cap to protect its gold-tipped hook head. These caps are made of a nicer type of plastic than other caps we’ve seen from other brands. They won’t readily crack, scratch, or stretch out. Wondering about using seed beads with these steel hooks? Keep in mind the results below are approximate. Bead hole sizes and labeling vary among manufacturers, colors, finishes, and also within the same bead batch. The mm. size of a crochet hook does not typically measure the girth of the hook tip, so a crochet hook made in a different style, or at a different time within the same brand might coordinate differently with bead sizes. Seed bead size 1° or 1/0 (a.k.a. “jumbo seed bead”) fits 75% of the time onto the 1.75 mm hook. 100% of them would fit on the next smaller size (1.50 mm). Seed bead size 6° or 6/0 (a.k.a. “E-bead”) fits 50% of the time onto the 1.25 mm hook. 100% of them might fit on the next smaller size (1.00 mm), or else the 0.90 mm. Seed bead size 8° or 8/0 fits 50% of the time onto the 0.75 mm hook. 100% of them might fit on the next smaller size (0.60 mm). Seed bead size 10° or 10/0 fits 75% of the time onto the 0.60 mm hook. 100% of them might fit on the next smaller size (0.50 mm). Seed bead sizes 11° and 12° or 11/0, 12/0 fit 50% of the time onto the 0.50 mm hook, depending on the source.